Assortment of scrumptious vegan cakes and delights prepared by the chefs from the Sea Shepherd ships, the Bob Barker, Sam Simon and Steve Irwin. 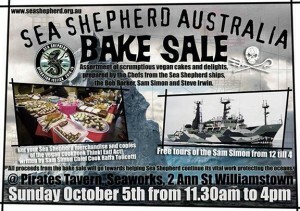 All proceeds from the bake sale will go towards helping Sea Shepherd continue its vital work protecting the oceans. Ride to Williamstown via the punt. We will ride direct to the punt via Lorimer Street. Phone 0412703483 if the weather is bad in case we cancel.